We shot this session at the beginning of november. Cristina and John really wanted a session at sunrise and by the Field Museum, where they would get married the following summer. It was cold and still, as soon as we started shooting, we saw a small party running into the water for a Quincinera trash the dress. I really enjoy sunrise sessions. 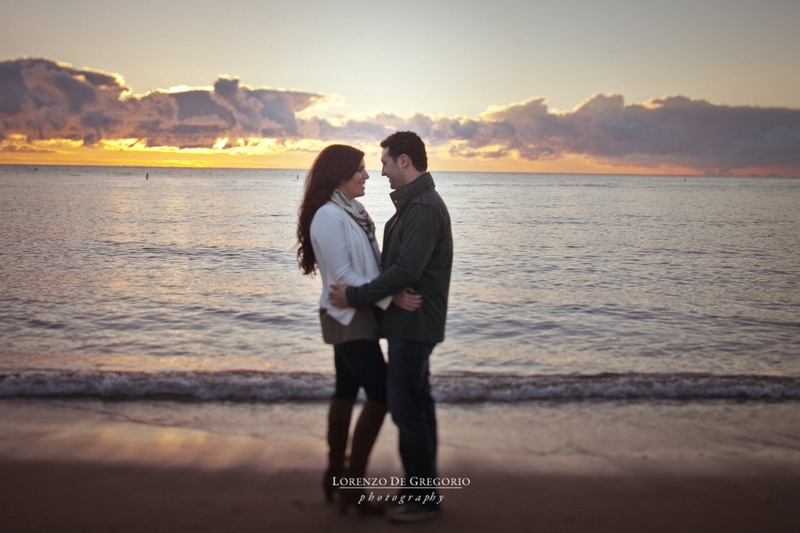 If you are considering to shoot your engagement in the vivid light of the morning and you want to see more locations, then check also Ashley and Dan’s sunrise shoot, Erin and Luis’s engagement by North Avenue Beach, Sheila and Brian’s pictures at Humboldt Park, Ashley and Chad’s photos at Millennium Park, Patricia and Byron‘s memorial day sunrise engagement at the Planetarium or Sara and Andre at Fullerton beach and Motrose. Cristina and John on Lasalle bridge, Chicago. If you liked these downtown pictures, then you might love Se Won and Phil’s collection or Lindsey and Mark‘s pictures at Millennium park at Kenzie bridge. And if you are interested to a downtown Chicago sunrise engagement session, you should check Ashley and Dan’s shoot or Ashley and Chad’s Millennium engagement photos. If you are looking for something completely different, then browse the fall photos of Brittany and Matt at the Morton Arboretum.